While walking down the aisle for his father's state funeral at the National Cathedral on Wednesday, former President George W. Bush was carrying something for former first lady Michelle Obama. Those familiar with Bush's friendship with Mrs. Obama will know why it was a mint in his hand. At the funeral for former Sen. John McCain a few months ago, Bush and Mrs. Obama were seated next to each other. At one point, Mrs. Obama asked 43 if he had a mint. It turned out he did, but the problem was it was clearly years old - it had the presidential seal on it. She teased him about it at the time and recalled the moment fondly in an interview on the "Today" show. It became such an inside joke between the two that he had do it again at today's memorial. Check out the moment President Bush handed Mrs. Obama a mint and her amused reaction. 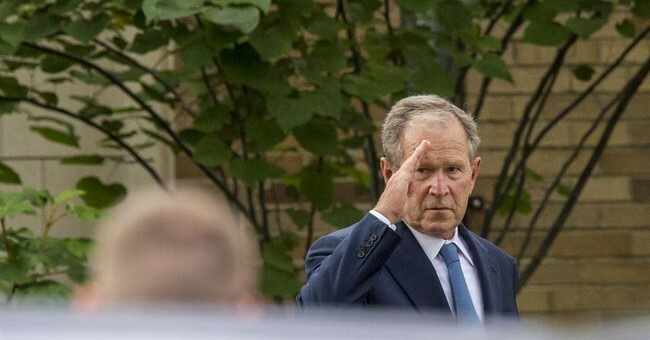 FRIENDSHIP GOALS: In a sweet gesture at the funeral for his father, George W. Bush handed former first lady Michelle Obama a piece of candy in a moment reminiscent of their time at the funeral for Sen. John McCain. ???? Mrs. Obama is now so fond of 43 that she calls him her "partner in crime." President George W. Bush is among those giving a eulogy for his father at Wednesday's state funeral.